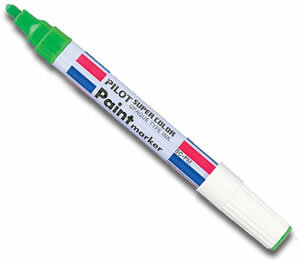 Pilot Paint Markers are basically gloss paint in a pen! Marking just about any non absorbent surface it is waterproof, permanent and quick drying. With many industrial applications. Gloss paint in a pen! A sharp glossy surface on most non absorbent surfaces. Permanent and waterproof with a medium, bullet tip nib that gives a 2mm line.